Instead of just shaking your fist, let BAF bring your demand for better bike infrastructure to Congress. A few months ago, we told you that Building America’s Future had released an app called, “I’m Stuck!” It allowed you to send a quick email to your Congressional representatives, telling them that you were stuck in traffic, or on an overcrowded bus or a delayed train, and you wanted Congress to approve more funding to upgrade infrastructure. 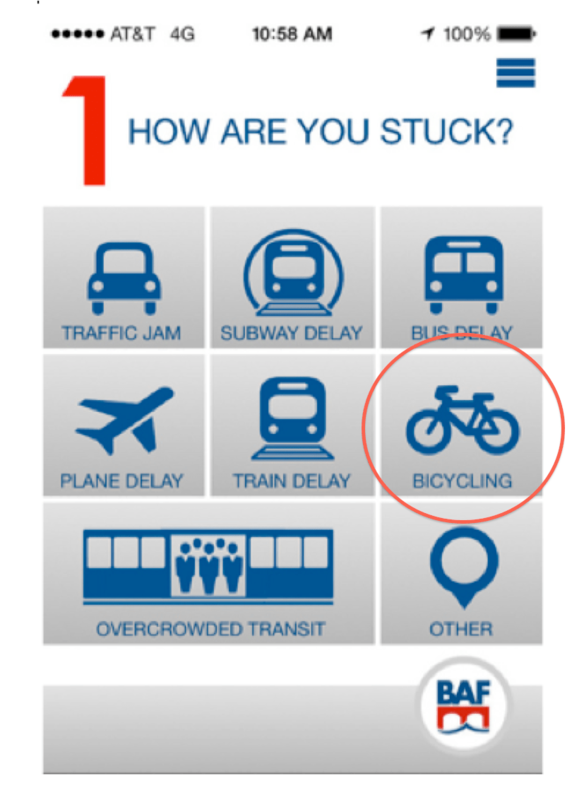 At the time, we noted that there was no bike/ped component to the app, but BAF has changed that — halfway, at least. I’m stuck on my bike without a safe route to travel. Bicyclists like me need safe routes, such as dedicated bike lanes — and we need your help. Please include funding for additional bicycle infrastructure in any new transportation and infrastructure investments. It’s important. It’s your decision. It’s past time. If it were up to me, the message would add that by riding a bike, the person sending the message is doing a big favor to everyone else using the transportation system — or breathing the air, for that matter. And it would include an option for pedestrians. According to BAF, the app has been downloaded 11,000 times and 3,500 messages have been sent to Congress. The old version didn’t let them track how many were complaining about sitting in traffic versus how many were complaining about inferior transit. And as we mentioned last time, you’ll have to customize your message if you want to make sure Congress knows that you’re not asking for more car lanes but rather a transit line that would get you off the road altogether. And remember, distracted driving rules apply. Even if you’re on a bike, please pull over before sending this message! I’m on my bike, and I’m not stuck in traffic. However, my route is much longer and less safe than it could be with more and better bicycle-specific infrastructure. Many more people would also choose to ride a bike over being stuck in traffic if better facilities existed, which in turn would improve congestion without the need for hugely expensive highway projects, improve air quality, increase traffic safety, and benefit the health of our communities for all ages. Your help is needed to make this happen. Please include funding for bicycle facilities in any new transportation and infrastructure investments. It’s cheap. It’s easy. It just makes sense. Their app doesn’t even let the makers count how many people have pushed each button?! How do they expect us to believe that this sends anything like a meaningful message to congress? Stuck With Bad Transit Options? There’s an App for That. Could the Strava App Provide the Biking and Walking Data Cities Crave?